So I started reading and learned a number of interesting things (which I have written up in more detail here). Alberta’s oil sand reserves are estimated at 168.7 billion barrels, which eclipses the reserves of Iran, Iraq, Kuwait and Russia. What makes these reserves different from those in Saudi Arabia, Venezuela and the countries named above is that they are in the form of crude bitumen. As has been discussed widely, the mining, upgrading, transport and refining of this resource is very energy intensive. As a consequence, well to wheel emissions from these oil sands are 14-20% higher than those of a weighted average of transportation fuels used in the United States. The problem the owners of this precious resource have is that there simply is so much of it and currently there is nowhere near enough transport capacity to get the desired number of barrels to refineries. This is not news. What I argue below, however, is that even if every pipeline project on record is built on time and rail capacity is expanded aggressively, there still is not enough transport capacity to meet industry-projected supply. The Canadian Association of Petroleum Producers, an industry alliance, anticipates rapid growth in the production of oil sands until 2030. According to their projections the supply of total crude, both heavy and light, will grow from 3.438 million barrels per day (mbpd) to 7.846 mbpd. 97% of this growth is projected to be due to the development of oil sands. This represents a 3.8 fold increase in the supply of oil sands compared to today. As local refinery capacity is severely limited (Goldman Sachs, 2013), the majority of the additional industry-projected 4.285 mbpd by 2030 have to be shipped out of Northern Alberta. This can be done by a pipeline to the West, East or South, or surface transport (rail or barge). Pipelines are the least expensive mode of transportation and allow the shipment of both light and heavy crude. Goldman Sachs estimated total takeaway capacity via pipeline at 2.9 mbpd in 2013, plus another 0.454 mbpd of local refining capacity. Currently estimated rail capacity to the U.S. is 150,000 bpd and could reach 500,000 bpd by 2017/8. Therefore the required additional takeaway or local refining capacity in 2030 will be 4.492 mbpd. 1. All pipelines get built, rail capacity is ramped up to 500,000 bpd by 2018 and continues to grow by 76,000 bpd per year thereafter. 2. All pipelines except Keystone XL get built, rail capacity is ramped up to 500,000 bpd by 2018 and continues to grow by 76,000 bpd per year thereafter. 3. All pipelines except Keystone XL, Alberta Clipper 1 & 2 get built, rail capacity is ramped up to 500,000 bpd by 2018 and continues to grow by 76,000 bpd per year thereafter. 4. No pipelines get built, rail capacity is ramped up to 500,000 bpd by 2018 and continues to grow by 76,000 bpd per year thereafter. 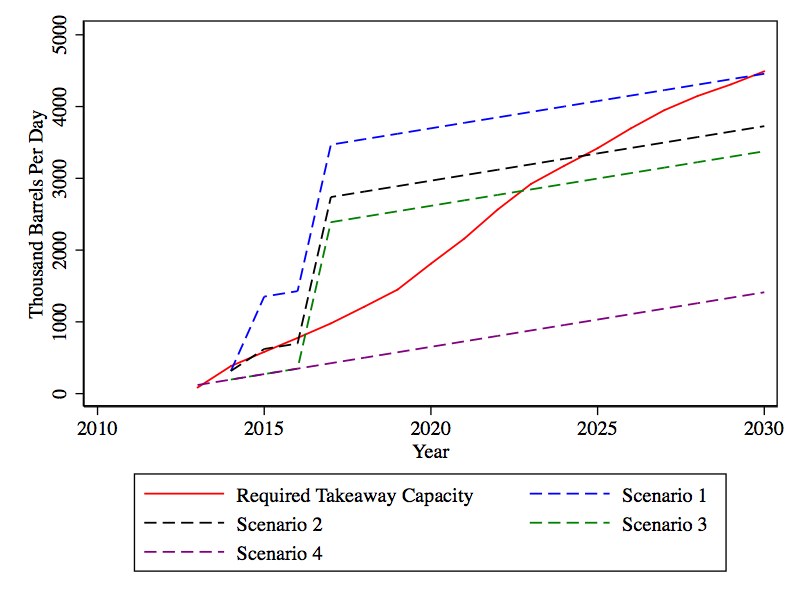 The figure above plots available takeaway capacity for each of the scenarios against projected takeaway need. The first thing to note is that the only scenario that provides sufficient takeaway capacity to get the 2030 level of producer projected bitumen out of Alberta is scenario 1, which assumes that all proposed projects get approved and rail capacity is aggressively built out. This scenario also has plenty of spare capacity until 2030 and would minimize the need for railway transport until the end of the period. Scenario 2, which is a world sans Keystone XL, has plenty of capacity until 2024, which is when both high- and low-cost transport modes are filled to capacity. At this point, there is no currently proposed pathway, which would be able to ship out the difference between the red line and the black dotted line as of 2024. The total amount of this triangle is roughly one billion barrels that would “stay in the ground” by 2030 – assuming no additional projects. For scenario 3, which is the green dotted line, producers run out of shipping capacity by 2023 and the missing capacity results in 1.9 billion barrels remaining in the ground. If none of the pipelines get built within and out of Canada and one has to rely on this rail scenario, capacity would run out this year and roughly 10 billion barrels stay in the ground. The last scenario would require that all pipeline projects are denied and no alternate projects proposed and granted. What is noteworthy about the last scenario, is that if no pipelines get built, rail does not provide sufficient capacity to meet projected takeaway demand in the short run. Not building Keystone XL would make the rail capacity constraint binding and therefore lead to slower extraction even in the short run. As discussed in the previous section, the first factor which will slow development of oil sands in the absence of Keystone is the fact that according to the scenarios I describe above, there is simply not sufficient transport capacity to realize the supply projections by Canadian Petroleum Producers out to 2030 even if all other projects are built and rail capacity grows most rapidly. It is important to note that this argument is independent of the marginal cost of resource extraction, which is addressed by a variety of other reports. The second factor has to do with regulatory uncertainty. As none of the projects so far have been approved and as it is less than certain that the Northern Gateway or any of the other projects will gain regulatory approval, large-scale investments in oil sands extraction remain a risky investment. The path forward does not look to be a smooth one for many of these projects, largely due to local and regional resistance and multiple court challenges. Goldman Sachs has in the past downgraded the resource for this reason. The third factor, which is of key importance, is that currently oil sands enjoy an unfair advantage as they are a very carbon intensive form of transportation fuel. In the absence of a carbon tax or other price-based mechanism, its price is artificially lower than socially optimal. Should a global or U.S.-only lifecycle analysis (LCA) based carbon tax emerge in the next decade, this will decrease the price per barrel received by producers of oil sands and lower their profit margins. An LCA-based carbon tax would also mean that product shipped via rail would carry a higher penalty than product carried via pipeline. Building Keystone would therefore provide oil sands with an advantage – even in a world with a carbon tax. All of this again would lower returns to investment in oil sands development. Fourth, the future demand for petroleum-based transportation fuels depends heavily on the availability and cost competitiveness of renewable low-carbon alternatives and overall demand. Fuel efficiency regulations, which are already on the books, and further tightening of these standards, will shift in the demand for transportation fuels. More competitive renewables will further shift in the demand for fossil transportation fuels. While it is not clear whether these alternative fuels will become cost competitive by 2030, delaying extraction of oil sands now will lead to lower demand in the future. The fifth factor is related to environmental regulation of rail transport. Shipping crude oil, be it heavy or light, by rail is risky, as accidents have significant environmental and economic costs associated with them. A significant increase in rail transport (in our scenario an 11-fold increase from today) would likely result in increased safety and environmental regulation, which would further drive up the costs of rail transport. Higher transport costs by rail would result in lower profit margins, since in my calculations rail is used fully in all scenarios. Finally, the one factor that is uncertain is the very costly development of local refining capacity in Alberta. The refined product would still have to find its way to market and this is done by pipeline or rail, which we show is significantly constrained already. If we use these industry projections on light, medium and heavy crude oil supply out of Western Canada, my calculations suggest that in order to be able to ship projected supply by 2030 all proposed pipeline projects have to be built, along with a significant increase in rail transport. My calculations suggest that not permitting Keystone XL will result in a binding transport constraint by 2024 at the very latest. If all planned pipeline projects are significantly delayed, not permitting Keystone XL will very likely reduce production in the short run and continue to do so unless additional pipeline capacity comes online, which is less than certain. While this post does not conduct an oil-industry-wide equilibrium analysis, it suggests that not permitting Keystone XL to proceed will keep a minimum of one billion barrels of heavy crude from Canadian bitumen in the ground by 2030 – in the absence of additional transport or refining projects. Of course, globally speaking, 1 billion barrels sounds like a lot, but the U.S. consumes that amount in about 50 days. As carbon is a stock pollutant as far as human time frames are concerned, not permitting Keystone “buys time” for alternative transportation fuels and climate policies to develop. This would allow all transportation fuels to compete on a level playing field, where carbon is taxed at its marginal external cost, which is a comprehensive policy solution. Trying to cure this large-scale burn with thousands of Band-Aids is simply not an efficient approach. Looking again at your rail capacity figures; they seem far below what has taken place already and what is likely to continue if Keystone is not constructed. Basically, North Dakota went from zero to a million barrels per day rail capacity between 2007 and 2013. You offer a figure of 500,000 bpd out to 2018 and 76,000 bpd per year thereafter. If a single state with one primary rail carrier, BNSF, can ramp up at a rate of 200,000 bpd per year – then I would argue that the entire region could easily accomplish 1 million bpd by 2018 and 250,000 bpd per year thereafter. Major rail carriers included CN and CP in Canada as well as BNSF and UP in the United States. CN has trunk lines to ports at both Vancouver and Prince Rupert, CP only to Vancouver. Both Canadian carriers have access thru the U.S. to Gulf ports. BNSF has access to Puget Sound and Portland via two mainlines and access to points east as well as to Gulf ports. UP has more limited access to Alberta oil, but has the most developed network in the U.S. west with mainlines to the Pacific Northwest, Northern California, Los Angeles, Texas, and Louisiana. Stopping Keystone will be a gold mine for the railroads, but Alberta oil production will get to market – regardless. See this article, “Soaring North Dakota oil production pushing crude to rails,” in the Twin Cities press. This analysis was conveniently omitted that would have showed that oil sands less ghg intensive to other heavy oil sources even those originating in the United States. Oils sands will also have a higher intensity compare to conventional oil – but that is what you get when you compare apples or oranges. Professor, it is obvious where you get your funding from to write this type of biased propaganda. I agree with some of your blog but I also see a degree of bias in your analysis. In reading your post and I cannot believe that you conveniently did “…not conduct an oil-industry-wide equilibrium analysis…” Had you conducted a detailed fuel analysis or read reports from ICF or IHS it would have been evidently clear to you that Canadian oil sands are less intensive than the Venezuelan and Mexican heavy crudes the United State imports. Perhaps a detailed analysis of the California heavy crude is warranted, to demonstrate how those emissions compare. The United States compromises less than 5% of the worlds population but manages to consume more than 20% of the world’s energy. The United States is the world’s second largest emitter of greenhouse gases (GHG) at 5,433,057 kilo tonnes (Kt) or 17.5% of the total global GHG emissions right behind China who emits 8,286,892 Kt or 26.5%. Canada emits 499,137 Kt or 1.59% of global GHG emissions and the oil sands makes up 1.5% of Canada’s 1.59% global contribution. America likes to talk about GHG emissions but your government will not impose a carbon tax to reduce GHG emissions in America. The dialogue around Keystone is simply a means by the United States government to divert attention from its own GHG issues by singling out Canada’s Keystone pipeline. Let’s not forget the issue of energy security – perhaps if the geopolitical environment changes in the next few months that may change your opinion of the keystone pipeline. Thank you for the opportunity to comment, professor. Not building the Keystone will also mean higher energy prices which will hurt driver and benefit Putin. I must disagree. You can get meth and coke anywhere in North America and they are both illegal to produce and to distribute. Oil sands oil is legal to produce and distribute – plus there will be increasing demand. It WILL find its way to market, regardless. Of greatest concern are routes that are far more environmentally damaging than Keystone. Two of these are to Inuvik on the Arctic Ocean via the Mackenzie Valley and to Churchill on the Manitoba coast of Hudson Bay. Both the Northwest Territories and Manitoba are facing increasing budgetary shortfalls and are eyeing the liquid wealth of Alberta. Alberta’s provincial government is overwhelmingly pro-oil as is Saskatchewan’s. Blocking the Keystone will only create greater environmental risks in extremely fragile ecosystems.